MFA is proud to be a vendor of Camp Chef products. MFA affiliates can order Camp Chef products and many keep several in stock at the locations. The company is know for great products, great instructional videos and support for their products. 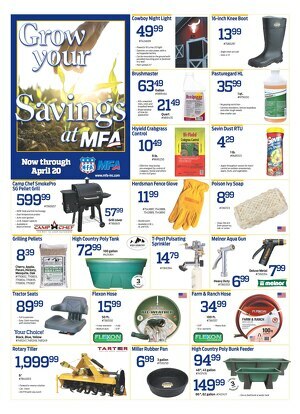 MFA Farm Supply offers sales throughout the year. Our current sales flyer will display here on this page when active. MFA’s Farm Supply Division provides the products you need whether you’re a row crop farmer with thousands of acres or a newcomer to the rural lifestyle with just a few acres. The same holds true from livestock ranchers with thousands of animals to individuals with just a few. We carry products and supplies for all types of farm animals. As a complete division of the cooperative, Farm Supply carries a complete line of livestock equipment, fencing supplies, baler twine, and rural-lifestyle hardware and products. MFA handles a complete line of popular lawn and garden products. Whether you need work gloves, garden rakes, sprinklers or fencing products, visit your nearby MFA retail outlet. To make certain our customers have ready access to these supplies, the Farm Supply Division maintains a warehouse in the midst of MFA’s sale territory. To give you an idea of how extensive our Farm Supply Division is, we have an annual volume exceeding $20 million. In fact, our Farm Supply Division has been successfully supplying our stores and customers since its formation in 1945. As part of its expertise, MFA’s Farm Supply Division sorts through thousands of product lines to bring affordable, quality farm supplies to the country. We use large-scale purchasing and a centralized warehouse system to pass savings to our customers. Click to find an MFA locationFind the MFA affiliate in your neck of the woods.